YOULL LEARN TO LOWER YOUR EXPECTATIONS ABOUT WHAT YOU CAN A - ProudMummy.com the Web's Community for Mums. YOU'LL LEARN TO LOWER YOUR EXPECTATIONS ABOUT WHAT YOU CAN ACCOMPLISH IN A DAY. 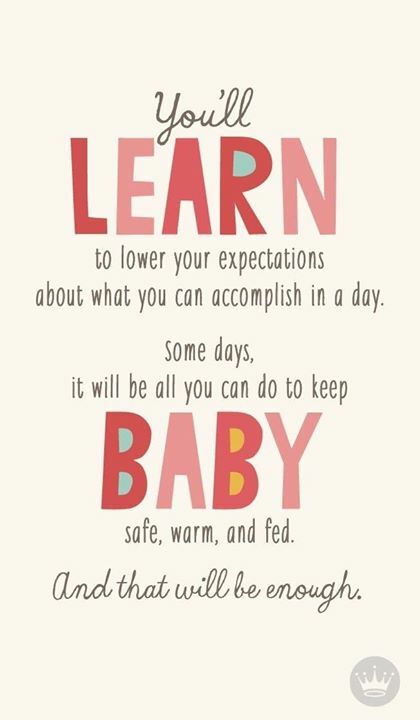 SOME DAYS, IT WILL BE ALL YOU CAN DO TO KEEP BABY SAFE, WARM, AND FED. AND THAT WILL BE ENOUGH.